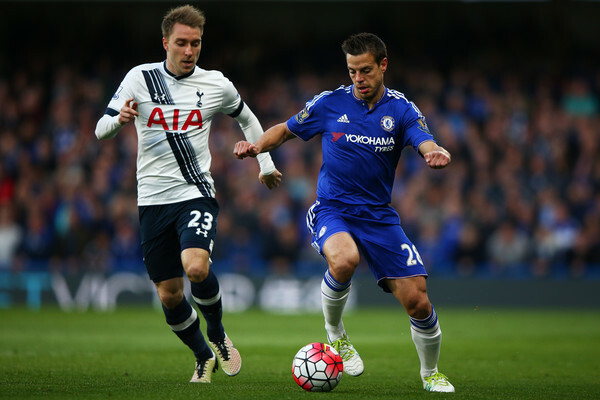 Chelsea v Tottenham: Who starts for Chelsea tonight as we look to end Tottenham's title bid? Tonight all eyes will be on Stamford Bridge and especially those up in Leicester as Chelsea take on Tottenham with anything less than victory for the visitors will hand the Premier League trophy to Claudio Ranieri's outstanding Leicester team this season. Tottenham come here under immense pressure and it will be interesting to see how they cope! As for Chelsea? We come into the game with the pressure of expectation from the supporters in what is one of the biggest games of the season due to the rivalry that has built throughout the years. Anything less that 100% commitment from our players will not be accepted and the players sound like they are only too aware of what it means to keep our unbeaten record at Stamford Bridge for 26-years going. Some would argue that there is nothing to play for as far as Chelsea are concerned but with Antonio Conte taking a watching brief, the Chelsea players are quite literally playing for their futures at the club now. Not only that, but personal pride is at stake after the debacle we had to sit and witness against Manchester City the other week. Guus Hiddink MUST get his team selection correct if we are to have a right go at Mauricio Pochettino's side. I won't deny that I look at the Tottenham team now and see a perfect balance to it, couple that with a good blend of ability, Tottenham will pose us a massive threat this evening. The likes of Loris, Alderweireld, Dier, Dele Alli and Harry Kane provide Spurs with an important spine that all good successful teams need. Chelsea were lucky enough to be blessed with the spine of Cech, Terry, Lampard and Drogba and look just how much we have achieved in the last twelve years! Tottenham are on the up and with the manager signing his new contract the other day, have found stability in someone who has proven to be a good man manager as much as being tactically aware. These days it's all about playing people to their strengths and with Chelsea fans being only too aware, giving some of the younger players a chance to thrive. In Dier, Alli and Kane they have done exactly that. It really is a toss up tonight with both sides coming into the game with something to prove. You couldn't honestly hand on heart pick a winner ahead of the game as it will be down to who turns up on the night to deliver a performance that matters and we all hope it's Chelsea! So to the Chelsea team news and it's a massive relief to know that both John Terry and Gary Cahill are back in contention and I fully expect both of them to come in and start the game this evening. Ivanovic will revert back to right back with Cesar Azpilicueta moving back across to the left. I sincerely hope that Guus Hiddink remains solid in midfield this evening and plays BOTH Matic and Mikel in the holding role with Cesc Fabregas pushed forward into the number ten role. Eden Hazard and Pedro to continue out wide and Diego Costa up front. It's hard on the likes of Willian and Oscar but needs must in a game that we need to keep tight and compact. For Tottenham it's do or die but for Chelsea it's no pressure, freedom to play our game and to hopefully take advantage of one or two nerves from the visitors. They talk a good game beforehand but knowing what a draw or defeat means, it will be interesting to see how they cope. Sorry to those in North London. I cannot see us getting beat meaning your title dreams are over!